Trekking destination of choice in the heart of the mythical Himalayas, Nepal is a small country legendary crossroads on the road salt and silk which combines the safety of many ethnicities. At daybreak, the snowy peaks reveal breathtaking views which unfolds the palette of pastels magnified by the sun. A little further down in the valley, the many temples, pagodas and stupas invite the sharing of Hindu and Buddhist spirituality strongly represented. This former small kingdom that became a republic in 2008, is inhabited by people with bright faces and with a legendary sense of hospitality. 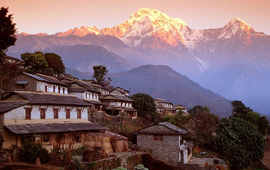 Nepal has a very wide variety of landscapes, ranging from dense tropical forests of the Terai in the South to the world's highest mountains to the North. By itself, it has eight of the ten highest peaks in the world, including Mount Everest (Sagarmatha in Nepali), which marks the border with Tibet. It has often been compared to a gigantic staircase Nepal beginning in the foothills of the Gangetic plain and the top forms the roof of the world. We observe one of the most curious of the Earth geographical phenomena. The morphological structure of the country is organized into longitudinal strips forming five major natural regions corresponding to five levels: the Terai, the Siwalik, the MahabharataLekh, Nepali tea and the great Himalayas. The Terai region or low, is a land of alluvium forming the foothills of the great plain of the Ganges. The Siwalik: it is on this mountain formation where Indian and Tibetan plates meet. The MahabharataLekh is a real mountain. Nepali Teak, the heart of the country, is the most important level. Cross rivers come to share this plateau in nine natural basins. This is the richest part of the country, and that where the largest cities (Kathmandu, Patan, Bhaktapur and Pokhara). The Himalayas: the 14 summits of our planet exceeding 8000 m, 9 are located in Nepal or on its borders. There are forests and crops to 4000 m, pasture to 5000 m, and we even got to see flowering plants to over 6,000 m! The country has a population of over sixty different ethnic groups and castes. Chhetri caste (Kshatriya) is the majority group in Nepal, encompassing 17% of the population. Bahun caste (Brahmin) is the second largest group with 12% of the population. The Newars, considered the original inhabitants of the Kathmandu Valley accounts for 5% of the Nepalese population. Their language, Newari, is still spoken in the Kathmandu Valley. Nepal was until 2006 the only country whose official religion was Hinduism without discrimination towards the non-Hindus. In May 2006, the Nepalese Parliament made an amendment in the interim constitution and added the world secularism, giving equal rights to all the citizens in observing their religion. It was followed by the emergence of other religions, especially Christianity. Hinduism remains the main religion of Nepal practiced by 81% of the population. February: Losar (Tibetan New Year). Losar coincides with the first day of the Lunar New Year. It often falls on the same day as the Chinese New Year. The use of the left hand, considered unclean, should be avoided to give and receive. To salute, join the palms by saying "Namaste" it avoids the handshakes that the Nepalese are not used to that. To visit temples or monuments, you will be asked to remove your shoes, socks and so wearing easy to remove shoes is suggestible. We do not touch the head of a child. Do not direct the feet towards the alter of a temple. Towns and villages of Nepal wake up and go to bed early. In the evening, the outputs are limited to a dinner in town, a walk, or a cinema. In hot weather, this lifestyle is appreciable to enjoy the cool mornings and evenings. As a courtesy, always ask permission before taking a picture of a person, usually she will not refuse. The basic menu of Nepalese consists of a flat white rice (bhat) and lentils (dal) in juice, served in a small bowl, which is rice mixture to moisten it and it enhances the taste. The meals are regularly accompanied by a vegetable curry (tarkari) and a mixture of spicy ingredients (pickles). This is the famous dal bhat, this national dish whose Nepalese morning and evening feed. Usually vegetarian, it may nevertheless be served with chicken, served mostly meat. Tibetan cuisine is also widespread. A visa is required, and the passport must be valid at least another 6 months after the intended date of return. You can get your visa before departure or at the Embassy of Nepal in Delhi, but it is easily obtained at each border crossing, or at the airport in Kathmandu. Provide an identity and a 25 € for a period of 15 days from the date of shot. Learn about the site of the Embassy of Nepal http://www.ambafrance-np.org/Les-visas-pour-se-rendre-au-Nepal. Information relating only to holders of a French passport. For all other nationalities, check with your embassy. In winter, + 4:45 compared to Paris, and in summer, + 3:45. The official time is 15 minutes ahead of Indian time.. The national currency is the Nepalese Rupee (NPR) divided into 100 paisa. The currency comes in denominations of 5, 10, 20, 25, 50, 100 and 500. Euros and dollars can be exchanged at most hotels and banks. Travellers checks are also accepted at banks and major hotels. Have a maximum of small bills to make purchases. All credit cards are accepted in hotels and most shops, businesses and restaurants. Always keep your receipts of purchase and keep your exchange slips as well. The ATMs are becoming more common in large cities. No vaccinations are required for Nepal, but it is recommended to be up to date diphtheria-tetanus-polio. Other recommended vaccinations: typhoid and hepatitis A & B and. Antimalarial prophylaxis is recommended in some areas. Consult your doctor or international vaccination center of the Pasteur Institute (tel: 0890.710.811). Country information on the website of the Institut Pasteur: http://www.pasteur.fr/fr/map . The above information is given for guidance. They are subject to change by your departure, ask to prepare your trip. Carry your personal medical treatment and what fight against stomach and intestinal disorders. Provide protection against the sun often biting. It is highly advisable not to drink tap water, eat vegetables or fruit that you have not you removed the skin. Beware of air conditioning for hotels and always have a scarf to protect your throat temperature differences with the outside. Altitude sickness can be felt from 2500 meters with nausea and headaches. Kathmandu Valley to Chitwan is between 1350 and 2200 meters and poses no problem for anyone in good health. The voltage in Nepal is 220 volts. Outlets are in principle European style hotels but for some, it is advisable to bring an international adapter strip. Provide a flashlight in case of power failure in some remote areas, visiting some temples which stays in the mountains. The best way to explore the country by car or bus if you are in a group. Car rental with driver is due to driving conditions sometimes difficult. We also recommend the motorcycle, scooter or bicycle modes of locomotion are too dangerous because of the traffic intensity and the absence of rules of conduct (left incidentally). In Nepal, the practice of tipping is widespread and expected by your guides and drivers. It should not be seen as a constraint, but as a reward for services rendered. Its allocation and the amount is left to your discretion. As a guide, we suggest you allow between 8 and 10 € per day for the guide (depending on whether a local guide on a step or a tour guide for your trip) and from 3 to 5 € per day for the driver. In hotels and restaurants for employees (porters, waiters, etc..), you can thank them directly (expect between 0.5 and 1 €). Purchases can be made in shops, stalls and bazaars where it is customary to bargain. You will find pashmina shawls, silks, wool rugs and silk objects sandalwood prayer wheels, silver jewelry and precious or semi-precious stones ... Nepal is rich in handicrafts of all kinds, a true paradise for the buyer. The opening hours of shops vary from one region to another, but most of them open around 10:00 and close at 19:00 every day except Sunday. Banks are generally open Monday to Friday from 10h to 14h and Saturday from 10am to 12pm. Because of the climate and the temperature amplitude, there should be two closets. Light and comfortable clothing for the day but think jacket and sweaters for the mornings and evenings. A windbreaker is not useless. Do not forget the sunglasses special mountain, cap or hat and sunscreen high index. The climate of Nepal allows visit in any season of the year. But to see the mountains and wander on foot, it is imperative to go between October and April, dry and sunny period! The most favorable period extends from October to November. This is the beginning of the dry season, monsoon has greened up pastures, the sky is particularly clear and the temperatures are still pleasant. This is the high season. The end of the dry season - February to April - the rhododendrons are in bloom and the heat is omnipresent. It is the second largest tourist season. During the months of December and January, it is winter and temperatures can be quite cool. One should be equipped with good woollen clothes for the cold. Finally, it is recommended to avoid Kathmandu during the months of May and June when the heat is at its height, and where mud invades the streets and roads. This is the beginning of the monsoon. Vertices are cloudy and rains heavy.